If you are looking to create a warm, inviting, and highly traditional atmosphere in your dining room, you should think of a solid wood table with several matching chairs – the size and the dimensions of the set will depend on your room size. Also, do not forget that there are plenty of extending table models in stores, and the maximum amount of places when extended can reach 16 seats. 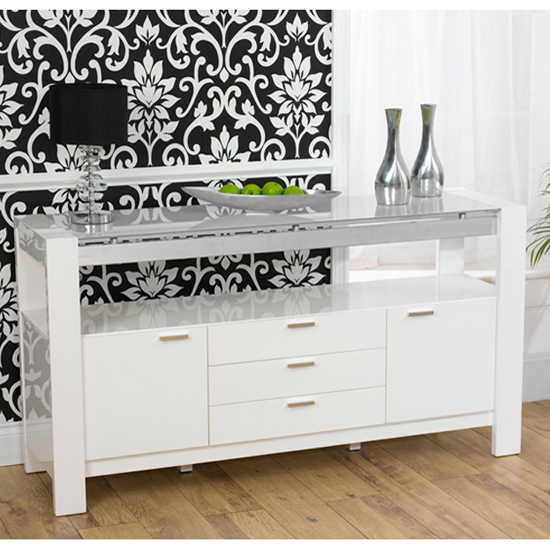 A light and extravagant look can be easily achieved with high gloss furniture. Shiny single-coloured surface looks both elegant and unusual, which is an amazing combination for contemporary dining rooms. High gloss dining table can be combined with glossy or leather chairs. And, finding other matching items will not be difficult either. Hundreds of stylish vintage solutions are available in UK stores. Some of them will be light, others – bulky. All in all, the choice will depend on the end result you have in mind. An antique wooden dining table with matching cushioned chairs can create a truly unique atmosphere in your dining room – no matter which wood shade you choose. Rustic, rough-looking furniture looks astonishing in spacious rooms. To make the interior even more realistic, you can substitute chairs with a bench. Sure, this is not a common arrangement for a dining room, but if you want to stand out – here’s your chance. Tempered glass dining table, faux leather and glossy dining room environment creates an ultra modern, shiny atmosphere in a room. To make it even more contrasting, you can go with black tinted glass table and white leather chairs – the combination is both classy and impressive. Of course, you will also have to consider your budget before you start working on your dining room interior. Yet, if you shop in big furniture stores , price variations between all of the above-mentioned patterns will be minimal – so feel free to choose any of them. Note, though, that your home interior in general should be logical and consistent. Even if you have difficulty choosing between an antique and rustic style (as per instance) – do your best to choose. Decorating every room in a totally different fashion will do you no favors, so once you have chosen a pattern to go with – stick to it in all of your rooms.